The Align Project, created by Green Builder Media and Austin-based prefab home builder, Kasita, made its debut this week at Solar Power International in Anaheim. Designed to educate people how to align our lifestyles with our values and environmental realities, the project stole the hearts and minds of attendees with its unique design, high performance products, smart technologies, clean mobility solutions, and compelling suggestions for enhanced sustainable living. Green Builder Media partnered with prefab builder Kasita to develop The Align Project, a Rendezvous with Reality—a one-year housing exposition designed to challenge, disrupt, and re-imagine some of society’s most entrenched ideas about what it means to live the good life in the U.S.A. To do this, we’re dissecting the spaces we live in and the products that serve (and own) us, and challenging many so-called “common sense” ideas. 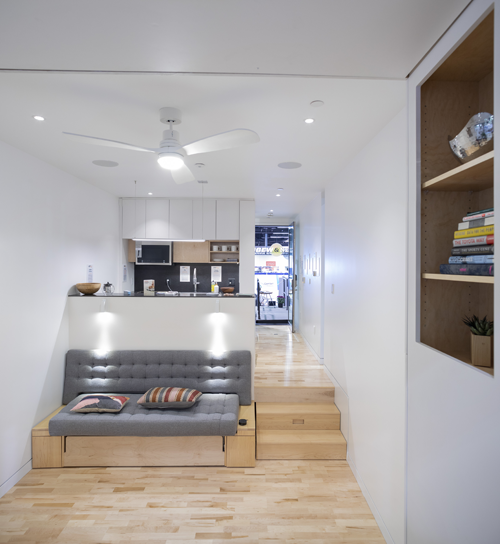 The centerpiece of The Align Project is Kasita’s small-footprint, net-zero, connected independent dwelling unit. Kasita has spent over $2 million in design and engineering to ensure that each unit is precision engineered, like a high-end vehicle, to take advantage of every square foot of space. This enables homeowners to use exactly the amount of space and resources they need to live comfortably—doing more with less, without compromising—creating what we call the 100% house (research shows that most homeowners only use a fraction of the space in our homes, whereas the Kasita doesn’t waste an inch) and substantially reducing the environmental footprint of the home. The house is smart and responsive as well--Kasita’s smart home technology platform, which seamlessly integrates devices, appliances, lighting and mechanical systems, is built into the home and available to the homeowner upon delivery. The smart home system features a variety of intelligent technologies that streamline resource use within the home, including Loxone lighting and lighting controls, Flo water monitoring and leak detection system, smart vent fan by Delta, and Awair indoor air quality monitoring system. Weighing in at 352 square feet, the Kasita makes a big impression with its sleek European design, bold Accoya siding (provided by Delta Millworks), and large-format windows and doors by Andersen. The home’s high ceilings, light-colored surfaces, and the 42-square-foot cantilevered “cube” surrounded by glass on three sides makes the space feel deceptively spacious and airy. The Kasita is net-zero thanks to its high-efficiency Rheem hybrid water heater and ductless mini-split HVAC system, Rockwool mineral wool insulation, DuPont Tyvek Housewrap for weatherization and moisture management. Designed to be its own microgrid, the Kasita home produces all of its own power. With super-efficient photovoltaic modules from Jinko (optimized for space-constrained applications) combined with a Tabuchi Electric battery storage system, the Kasita solar system blends high performance with reliability and unmatched intelligence. The solar system powers the Delta electric vehicle charging station, which, in turn, powers the Toyota Prius Prime, which also serves as back-up battery storage. The kitchen boasts super-efficient appliances by Haier, durable countertops by DuPont’s Corian Design, and a beautiful kitchen sink and faucet by Franke. The bathroom features a stylish, low-flow Duravit toilet and vanity, water conserving KWC faucets, and a durable Viega PEX plumbing system. The home’s resiliency is ensured by its durable steel frame, Viega fire protection system, and non-combustible Rockwool mineral wool insulation. And while the interior space is compact, the home’s living space is extended outdoors by its durable and beautiful composite deck by Trex. Perhaps the best part about the Kasita is its price tag—rolling off the production floor at approximately $150,000 (the final price depends on the finishes and solar system sizing), the turnkey house offers a beautiful, intelligent, and affordable option to buyers. To learn more about The Align Project and sign up to receive more information (including how to order your very own Kastia! ), check out the project microsite. And if you weren’t able to visit our booth at Solar Power International this week, don’t fret—you can visit us at CES in January and Design & Construction Week (IBS/KBIS) in February. If you’re interested in participating in the process of creating long-term solutions for a smart, clean, efficient, and resilient built environment, please join Green Builder Media at our upcoming Sustainability Symposium: The Desert Shall Bloom on February 18, 2019 on the UNLV campus in Las Vegas. And, don’t miss the celebration of our annual Sustainability Award winners the night before the Sustainability Symposium on February 17 at 6:00 p.m. at the exclusive Mr. Chow in Caesars Palace. Click here to register for the Sustainability Symposium 2019: The Desert Shall Bloom and Sustainability Awards gala. Space is strictly limited and by reservation only, so reserve your seat today! Register for the Symposium before October 1, 2018 using the code EarlyBird and you’ll receive a $100 discount. A sincere thank you to our generous sponsors, Samsung, Ingersoll Rand, Emerson, Andersen, and Caesars Entertainment for helping to make the Symposium and gala dinner possible. Want to learn more about The Align Project? Write to me at sara.gutterman@greenbuildermedia.com.